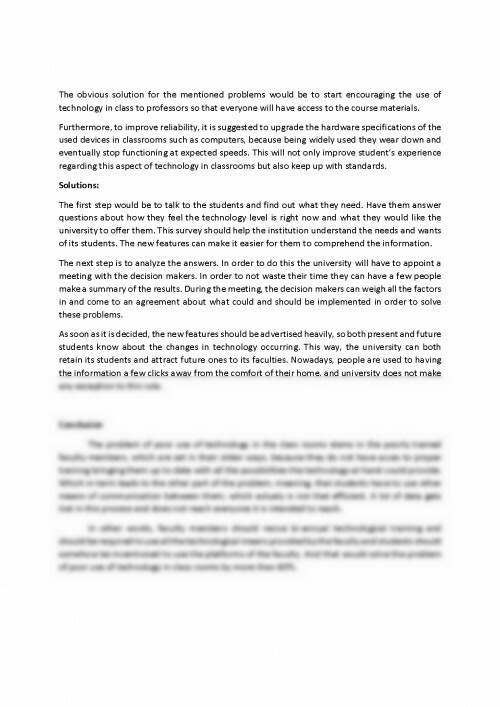 Technology for students and teachers has been debated throughout the years, more and more research suggesting it has a positive impact, especially in lecture or seminars where the communication between students and teachers is a top priority. So keeping this in mind, technology becomes a priority in every university, depending on the possibilities. The lack of such possibilities is a serious problem to the quality of university experience and knowledge, resulting every faculty must be thoughtfully equipped. Taking in our hand a more subjective manner, more specifically ASE, we can find a well-equipped environment, lacking just in the high-end tech, but covering the basic needs to classify as a modern university. Therefore, the point in having technologies implemented into university is to make sure that teachers can handle such subjects and know how to pass the information back to students. 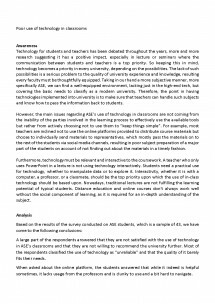 However, the main issues regarding ASE's use of technology in classrooms are not coming from the inability of the parties involved in the learning process to effectively use the available tools but rather from actively choosing not to use them to "keep things simple". For example, most teachers are inclined not to use the online platforms provided to distribute course materials but choose to individually send materials to representatives, which mostly pass the materials on to the rest of the students via social media channels, resulting in poor subject preparation of a major part of the students on account of not finding out about the materials in a timely fashion. Furthermore, technology must be relevant and interactive to the coursework. A teacher who only uses PowerPoint in a lecture is not using technology interactively. Students need a practical use for technology, whether to manipulate data or to explore it. Interactivity, whether it is with a computer, a professor, or a classmate, should be the top priority upon which the use of in-class technology should be based upon. Nowadays, traditional lectures are not fulfilling the learning potential of typical students. Distance education and online courses don't always work well without the social component of learning, as it is required for an in-depth understanding of the subject. 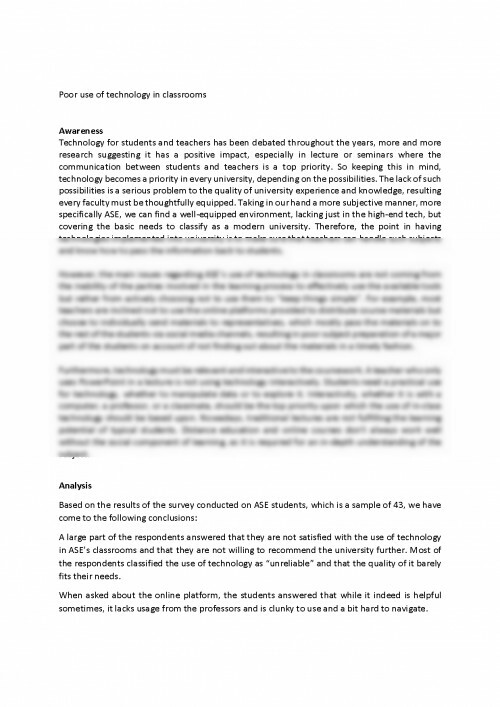 A large part of the respondents answered that they are not satisfied with the use of technology in ASE's classrooms and that they are not willing to recommend the university further. Most of the respondents classified the use of technology as "unreliable" and that the quality of it barely fits their needs. When asked about the online platform, the students answered that while it indeed is helpful sometimes, it lacks usage from the professors and is clunky to use and a bit hard to navigate. 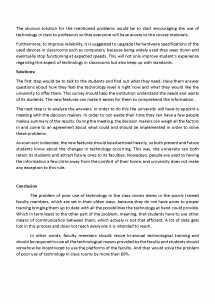 The obvious solution for the mentioned problems would be to start encouraging the use of technology in class to professors so that everyone will have access to the course materials. Furthermore, to improve reliability, it is suggested to upgrade the hardware specifications of the used devices in classrooms such as computers, because being widely used they wear down and eventually stop functioning at expected speeds. This will not only improve student's experience regarding this aspect of technology in classrooms but also keep up with standards. The first step would be to talk to the students and find out what they need. Have them answer questions about how they feel the technology level is right now and what they would like the university to offer them. This survey should help the institution understand the needs and wants of its students. The new features can make it easier for them to comprehend the information. The next step is to analyze the answers. In order to do this the university will have to appoint a meeting with the decision makers. In order to not waste their time they can have a few people make a summary of the results. During the meeting, the decision makers can weigh all the factors in and come to an agreement about what could and should be implemented in order to solve these problems. As soon as it is decided, the new features should be advertised heavily, so both present and future students know about the changes in technology occurring. This way, the university can both retain its students and attract future ones to its faculties. Nowadays, people are used to having the information a few clicks away from the comfort of their home, and university does not make any exception to this rule.